For quite a few years, since 1964 to be exact, there exist, de facto, two different Land Speed Records: the 'absolute' Land Speed Record, for vehicles with any type of propulsion, which is dominated by jets and rokets; and the LSR for automobiles, or the wheel-driven Land Speed Record. In 1965 this record fell to the Summers Brothers' "Goldenrod", which took it from Donald Campbell's "Bluebird", at a speed of 409.277 mph. It took twenty six years for an automobile to better that speed, albeit only by a fraction. It was Al Teague's "Spirit of 76" streamliner. Al Teague is a veteran Bonneville racer and he has built himself, in his small workshop, this car, which is quite a different vehicle compared to "Goldenrod" in that it only has one engine, as opposed to four, and rear-wheel-drive, whereas the Summers Brothers' had four-wheel-drive. The car had started life several years earlier, in 1976, as a lakester, which is a streamlined car with mandatory open wheels: for the body, instead of the usual belly tank, Teague had used a mould originally designed for a motorcycle streamliner. 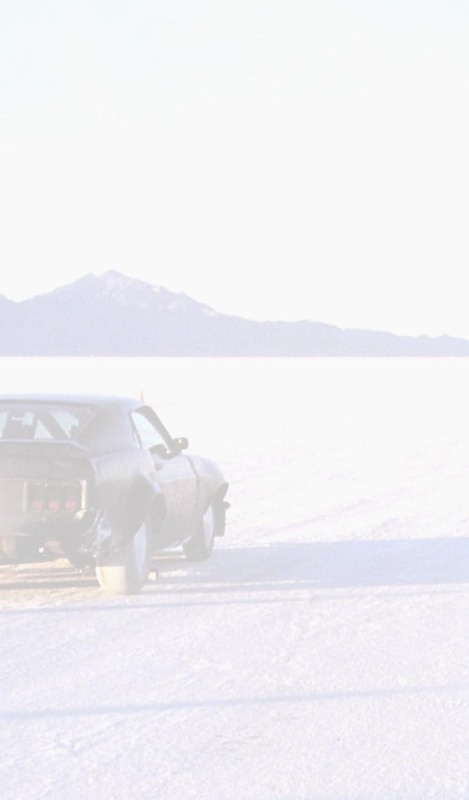 The chassis, as simple as possible in typical Bonneville style, is a tube space frame, with torsion bar suspension at the front and no suspension at all at the rear. The engine was in central position, right behind the driver. A few years later, in 1981, having made enough experience in the lakester category, Teague decided to modify the car into a full streamliner, with an all enveloping body which could eventually run for the wheel-driven record. Given the fact that the ex-motorcycle body was pretty narrow, Teague decided to use the lowest frontal section he could possibly obtain, by setting the rear wheels very close to each other right behind the engine. As to the front wheels, he designed an unconventional solution: the two wheels were mounted in tandem, although not in line, connected by the simplest linking he could figure out. It looked like a risky solution, but the car eventually proved to be one of the safest ever to run on the salt at top speeds. The car first appeared as a streamliner in 1982, still with open rear wheels; then for two years Speed Week was plagued with rainfalls, but in 1985 it began to show its real potential by setting a new C class record. By 1986 the rear wheels were enclosed in the streamlining, while in 1989 the car acquired its definitive looks, which was to remain unchanged till the present day. In the meantime the old Chrysler was replaced by a new Keith Black and Al's car had become one of the two or three fastest in the lot: it claimed the B class record in 1987 and again in 1988. In 1990 he bettered this record once again but this was not enough so... he added the A record as well, during the same event! True, he missed the honour of being the first to pass the 400 MPH barrier during a Bonneville meeting (Nolan White and himself both did it, but White did it first, at World of Speed in September 1990). 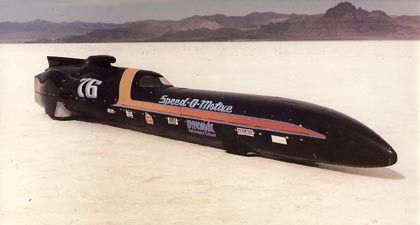 But just a year later his efforts had the best of all rewards that magic day in august 1991 when during the 43rd Speed Week he set the new record for Class A (unlimited) supercharged streamliners at an average speed of 409.978 mph over the mile (over the kilo the speed was even higher, 425.050 mph). After such an achievement you would expect the car to be retired and displayed in a museum. That is what usually happens. 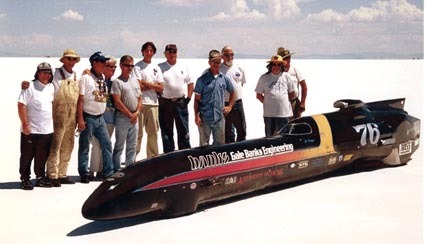 But Bonneville racers think different, they like to race year after year, and so did Al Teague and "Betsy" (that is what he calls the car himself, like she is a member of the family). They still do, to this day. Using engines of different displacement, they managed to gather over the years all the SCTA/BNI records in the "fuel" blown classes from AA down to C: that is four records, all still standing at the end of the 2000 season. The last one came in August 2000 at Speed Week, when Teague took the B Class record at 381.867. A small wing over the rear wheels, to improve traction, was tested at Speed Week 2001, but Teague's week ended early due to clutch problems. 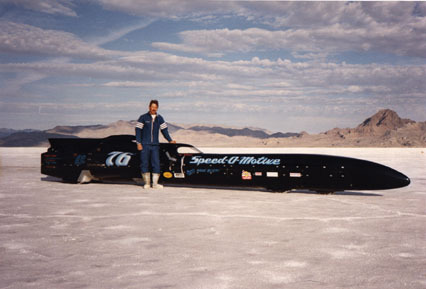 POST SCRIPTUM - On October 18, 2001, during the SCTA World Finals, at last Don Vesco obtained the FIA International record everyone expected him to take, at 458 mph. Turbinator being a turbine car, Teague's (and Summers') records will still stand, but Turbinator being a wheel-driven vehicle, the so-called "wheel-driven LSR" is now Vesco's, without discussion. Al Teague of course still holds the fastest record for a conventional piston-engined automobile. POST SCRIPTUM 2 (August 2002) - Two important things happened at Speed Week 2002. 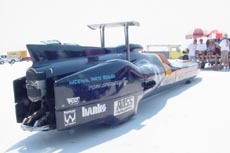 First, Nolan White driving his twin-engined Autopower streamliner set a AA/BFS record at 413.156. Doing this he took one of Al Teague's SCTA/BNI records, but also took Al's place as the fastest record holder on a piston-engined vehicle under SCTA/BNI sanction (while Al still holds the FIA records - see new "Who holds the "piston-engined" record?" page). The second and even more important fact was that Al Teague announced that his four runs at Speed Week this year (three of them at over 390 mph on the mile) will close his long and extremely successful racing career. 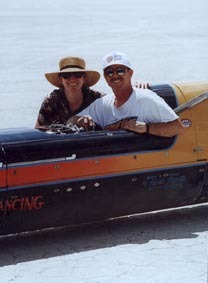 I am sure everyone in the land speed racing community will miss him (and "Betsy") VERY much!! POST SCRIPTUM 3 (October 2002) - Retiring from racing proved more difficult for Al Teague than setting records and right after Speed Week he decided to allow himself one last bit of fun and to run again at the World Finals in October. The Finals offered FIA sanction and Nolan White was eager to confirm the fantastic performance at Speed Week and take Al's FIA Group I Class 11 (over 8.000 cc) record (by now known as the "piston-engined lsr"). Al being the true sportsman he has always been, he preferred to leave the field clear for Nolan to eventually earn his well deserved day of glory and opted to run for the Class 10 record (5.000-8.000 cc) instead, which he took at the incredible speed of 405.976 mph on the mile and 406.520 on the kilo, the first time an under eight liter car has set a record at over 400 mph. Unfortunately, there were hardly any celebrations. Three days later the land speed racing community was mourning Nolan White, who had met with a very different fate when his car rolled after loosing all three parachutes at the end of the first run of his attempt. He died three days later in hospital (go to the what's new page for more details and links to tribute pages to Nolan White). POST SCRIPTUM 4 (26 September 2008) - After 17 long years one of the two FIA, Class 11, records set by Al Teague in 1991, the flying mile, has fallen to Tom Burkland: Tom was not able to better the kilo record though, which was quite a bit faster, so Teague is still the holder of the fastest International record for a piston engined vehicle, while Burkland is now officially the fastest on the mile. All the records set by Al Teague driving "Spirit of 76"
* These records (either kilo or mile, depending on your tastes) have been the "wheel-driven LSR" from 1991 to 1999, when they were beaten by Don Vesco. The kilo record still stands in the FIA over 8 litre blown piston-engined Class 11. ** In 1991, when SCTA created separate classes for blown and unblown engines, these records, which were still standing, became /BFS records. The 1990 B class record disappeared from the record book when engine class breaks were changed in 1994.